YOUR DAILY BRUCE: Another Year Blown. 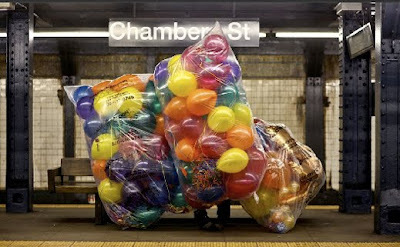 Did you ever see those short little men running around the city with massive bags of multi-colored helium balloons that take up half the street? Well, today my wife and the kids stumbled upon the place where they all live: The Balloon Saloon, in Tribeca. We dropped in for a few poppers, hats, horns, and balloons. We got everything we needed except for the balloons. They would only sell us 24 for 50 bucks. "No thank you," I said, and we strolled on out of there. Later that day, we ended up in a Scandinavian clothes store that gave us four balloons that they had hanging in the store, plus, a coupon for 15% off. — I love New York.